On September 17, 2001, in the aftermath of the events of September 11, President Bush signed a classified, covert action memorandum authorizing the Central Intelligence Agency (CIA) to seize and detain suspected terrorists.100 By the following month, October 2001, Aero Contractors, Limited (“Aero”) had begun to operate a Gulfstream V turbojet, aircraft N379P, out of North Carolina in the United States to secretly transfer individuals suspected of terrorism between countries and jurisdictions without legal process.101 The program was only suspended by Executive Order 13491 in 2009.102 This chapter of the report provides an overview of the program, with special attention to the partnerships that made it possible. Aero’s N379P was one of multiple airplanes used in the CIA operations. “Rendition” is an umbrella term that refers to any transfer of a person between governments.103 “Extraordinary rendition” is the secret and forcible transfer of an individual between States or legal jurisdictions outside of the law. 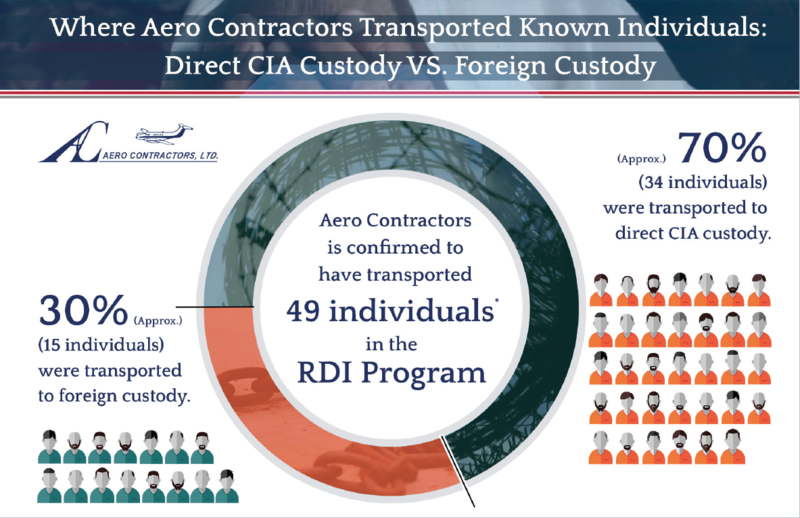 Through the RDI program of extraordinary rendition, the U.S. government worked with private U.S. corporations, such as Aero, and foreign agents to transfer suspected terrorists through two interlinked detention systems for coercive interrogation. The flights carried suspected terrorists either to foreign (non-U.S.) custody or to CIA custody in CIA-run secret prisons or “black sites.”104 The program of transferring individuals to and among these two systems for interrogations using torture is referred to in this report by the CIA’s name: the Rendition, Detention, and Interrogation (RDI) program. Aero Contractors security gate at Johnston County Airport. 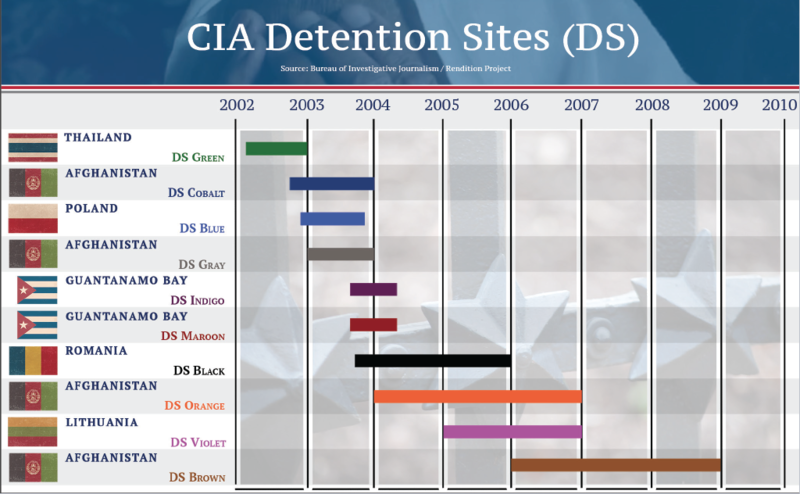 According to the Senate Select Committee on Intelligence (SSCI) inquiry into the CIA’s detention and interrogation program, the CIA held at least 119 individuals in direct CIA custody between 2002 and 2008.106 However, expert testimony before the North Carolina Commission of Inquiry on Torture (NCCIT) indicates that the actual number of individuals affected by the program is likely far higher. This is because of poor record keeping on the part of the CIA, the lack of research on and acknowledgment of detainees rendered to foreign custody, and knowledge of additional detainee renditions without corresponding flight paths, which indicates the existence of additional rendition aircraft.107 Therefore, the true number of individuals subject to the RDI program — and in particular the number, identities, and whereabouts of those rendered to foreign custody for detention or interrogation — remains unknown. The true number of individuals subject to the RDI program — and in particular the number, identities, and whereabouts of those rendered to foreign custody for detention or interrogation — remains unknown. Torture and ill-treatment were hallmarks of rendition to both foreign government custody and CIA secret detention. The “two programs entailed the abduction and disappearance of detainees and their extra-legal transfer on secret flights to undisclosed locations around the world, followed by their incommunicado detention, interrogation, torture, and abuse.”110 Torture and ill-treatment were hallmarks of rendition to both foreign government custody and CIA secret detention. Transferring individuals to foreign custody was an “integral component of the CIA program.”111 The U.S. government handed individuals over for coercive interrogation by intelligence agencies in countries such as Egypt and Jordan.112 Starting with the apprehension of Abu Zubaydah in March 2002,113 the U.S. government also began to render individuals to CIA-run prisons. Between 2002 and 2008, the CIA would go on to hold at least 119 individuals114 in ten CIA “black sites” in six countries around the globe: one in Thailand, one in Poland, one in Romania, one in Lithuania, two in Guantánamo Bay, and four in Afghanistan.115 Because the CIA ran a “black site” network throughout the RDI program, detainees were often transferred multiple times between these various sites, as well as to foreign custody, during their detention. According to U.S. government documents, upon abducting targeted individuals, rendition teams prepared them for flight by hooding them, performing body cavity searches, applying ankle and wrist restraints, and administering sedation, all without permission or explanation. Between 2002 and 2008, the CIA held at least 119 detainees in ten CIA prisons in six country locations and transferred an unknown number of terrorism suspects to third countries for detention and interrogation. 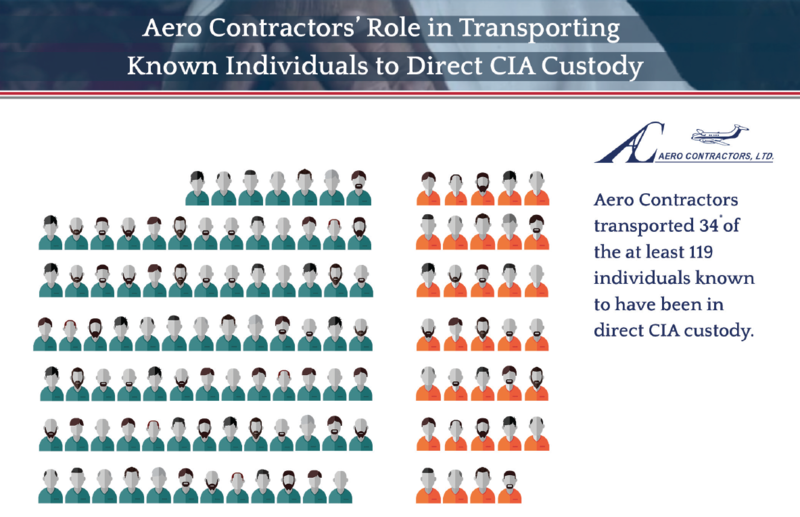 Aero Contractors, Inc. transported 34 of the detainees that were sent to CIA prisons and nine of the individuals transferred to custody of third countries. According to official figures, “at least 39” of the at least 119 individuals in CIA custody were subject to EITs.123 However, the actual identities, numbers, and whereabouts of individuals in the CIA program and those subject to torture and abuse remain unknown because the CIA “never conducted a comprehensive audit or developed a complete and accurate list of the individuals it had detained or subjected to its enhanced interrogation techniques.”124 Nor is the scope of detainee experience fully documented, given that detainees faced “harsher”125 confinement conditions and interrogations that were “brutal and far worse”126 than what the CIA had officially indicated to policymakers and other government officials. Providing ‘rest and relaxation’ for rendition crews during, or after, rendition operations. Private actors were ubiquitous in the U.S. government’s post-9/11 RDI program. To design the program, the CIA contracted two psychologists, James Mitchell and John “Bruce” Jessen, to devise its interrogation tactics. Shortly after the psychologists “formed a company specifically for the purpose of conducting their work with the CIA” in 2005, the “CIA outsourced virtually all aspects of the program.”129 Private aircraft companies also played a central role, primarily in the transport of individuals as well as in providing other associated logistical support. 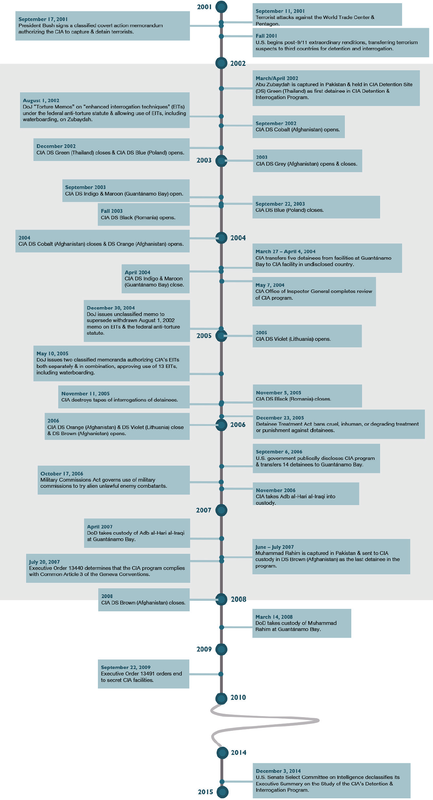 The second system, in place from 2002 to 2006,133 also relied on private companies and was organized through a “prime contract” between the CIA and DynCorp Systems and Solutions, LLC (and its corporate successor Computer Sciences Corporation (CSC)).134 Through this arrangement, DynCorp/CSC entered into agreements with aircraft brokers that in turn contracted with aircraft operating companies to supply the planes.135 Aero operated-aircraft, the Gulfstream V N379P, and Boeing 737 N313P conducted “over 80%” of identified U.S. government renditions between September 2001 and March 2004. As is further described in Chapters 2 and 8, within the United States, host states for these private companies also enabled these abuses, including by allowing companies to use public airports and by failing to investigate allegations about the use of public resources to this end. Additionally, because that inquiry was focused at the federal government level, it does not examine the role of states such as North Carolina without whose participation the program could not have been carried out. Despite the myriad crimes associated with the RDI program, no U.S. executive agency nor any U.S. state has held accountable anyone involved in the RDI program. Domestically, efforts to ensure accountability, including for North Carolina’s role in the RDI program, have been frustrated on many levels. Chapter 8 of this report examines the extensive role that North Carolinians have played in continuing to press for transparency and an end to torture. With respect to Congress, on December 9, 2014, the SSCI released a redacted version of its declassified Executive Summary on the Study of the CIA’s Detention and Interrogation Program.147 But the full study, which was the product of more than five years of investigation and totals more than 6,700 pages, remains classified. Additionally, because that inquiry was focused at the federal government level, it does not examine the role of states such as North Carolina, upon whose participation the program depended. Transparency and accountability for illegal and immoral components of the RDI program require full disclosure of the role of states within the United States; the contribution of private companies to official rendition, detention, and interrogation; the routes and processes of rendition; and the full identities and fates of those affected. Although the RDI program ended in 2009 and its initial legal underpinnings have been rescinded, there remain significant information and accountability gaps regarding the program’s scope, participants, and effects. Transparency and accountability for illegal and immoral components of the RDI program require full disclosure of the role of states within the United States; the contribution of private companies to official rendition, detention, and interrogation; the routes and processes of rendition; and a full accounting of the fates of those affected. Three cases have been submitted to African and Inter-American bodies involving individuals rendered on N379P and N313P. On April 9, 2008, a complaint was filed in the Inter-American Commission on Human Rights against the U.S. on behalf of Khaled El-Masri,169 who was transported on aircraft N313P. On December 10, 2009, a complaint was filed in the African Commission on Human and Peoples’ Rights on behalf of Mohammed Abdullah Saleh Al-Asad against The Republic of Djibouti. The complaint includes Mr. Al-Asad’s transfer on N379P.170 On November 14, 2011, a complaint was filed in the Inter-American Commission on Human Rights against the United States on behalf of Binyam Mohamed, Bisher al-Rawi, Abou Elkassim Britel, and Mohamed Bashmilah,171 who were transported on aircrafts N379P and N313P. There have been serious failures and omissions of transparency and accountability with respect to the U.S. post-9/11 program of extraordinary rendition, secret detention, and torture. The important, yet partial, official transparency that has occurred involves solely the CIA black site portion of the program. No formal accounting has occurred of those individuals transferred by the CIA to foreign custody for torture and unlawful detention. Nor has there been official accounting for the very significant role of private actors such as Aero Contractors in the RDI program. The lack of transparency and accountability undercuts the rule of law at the state and federal level.